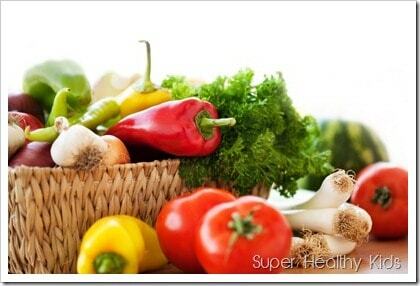 Do you wash your fruits and vegetables? Sometimes we do, sometimes we don’t. Even though we aren’t always diligent about it, it is a good habit to get into. While washing your vegetables isn’t a guarantee you will remove everything that could make you or your family sick, it can help. 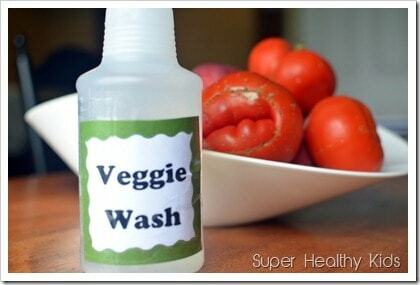 But, does washing your vegetables help? Yes it helps remove dirt and debris!! Yes it will help minimize exposure to pesticides, but not totally eliminate. Unfortunately, It may not protect your kids from specific resistant bacteria such as E.Coli or Salmonella! According to the International Food Safety Council, the E.Coli bacteria has made itself very resistant to cleaning, after it has clung to your produce effectively. It develops a film over itself to ensure survival. 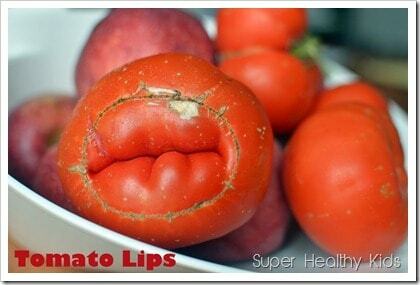 Sometimes, those little buggers even lodge themselves within the flesh of your produce, that would not be removed with any cleaning method. However, if they have not developed their film that helps them cling on, and are loose, they can be rinsed away. This is the same case with the salmonella bacteria. So, if for any reason, you can minimize the exposure to pesticides and bacteria, it most definitely should be a practice you could teach your kids. Then, placing our veggies in a bowl for a good soak, the kids spray them liberally. Let soak for 10 minutes. Step 2) The elbow grease under running water. 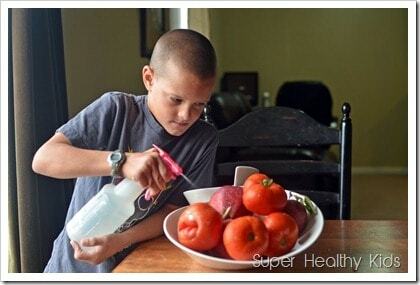 Simply by rubbing your fruits and veggies with your hands can be effective in cleaning your food. So, do you wash your produce? Because we have well water, we clean our fruits/vegs in spring water to insure no additional bacteria is added. It’s a hassle but necessary possibly even if u have municipal water that hA not been tested. Thanks for the info! 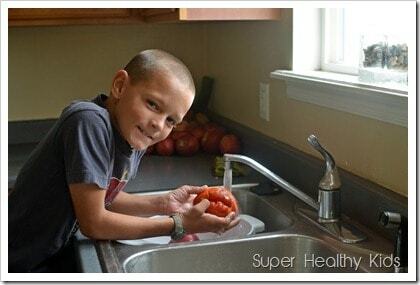 We wash our fruits and vegetables but just with water and elbow grease. We don’t use vinegar or let them sit but I think we will start. Can you taste the vinegar later? Not at all!! The vinegar gets totally rinsed off and doesn’t leave any taste. Thank you for the vinegar recipe. We use the elbow grease and water method but I still worry that it isn’t enough…especially with grapes! Believe it or not, dirt/soil (HSOs) are GOOD for you – but ONLY if it’s ORGANIC. I live overseas where tap water has to be boiled before drinking. We soak all of our produce in an iodine water mixture for 20 minutes and then rinse with drinking water. I’ll admit to being lazy with some things though and giving them a scrub with dish soap and water before rinsing and thoroughly drying them. I’d like to see how vinegar does with some of the bacteria and cysts found in our water. I usually do, because I’ve seen my own kid pick his nose, then pick up an apple at the store. Gross! I also use a vinegar bath on my berries. I always wash with water and elbow grease, but want to start using the solution. How do you store the vinegar wash? How long does the solution stay good for in a spray bottle? Thanks! Carolina- we just store this in the spray bottle under our kitchen sink. It lasts forever!! I have learn several excellent stuff here. Definitely value bookmarking for revisiting. I wonder how so much effort you place to make any such wonderful informative web site. Is it okay to use the vinegar on fruit too? 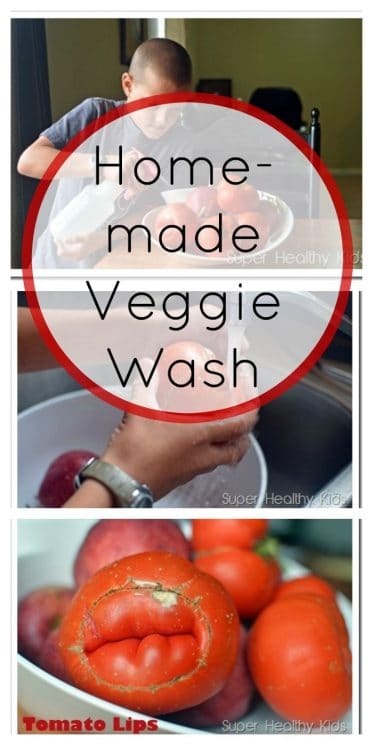 I wash my veggies and fruits with water and soap, then I rinsed them thoroughly. @shanna- yes, we also use it on most fruits- we don’t use it on berries. Based on how it’s written just underneath the ‘recipe’, to clarify, you’re placing the veggies in an EMPTY bowl and dousing them with the spray liquid and just letting the liberally wetted down veggies sit? When someone says ‘soak’, I take it as immersion / submersion in a boatload of liquid. Yes, that does sound confusing! We “soaked” them in the spray – not submerged in a bowl full of liquid.